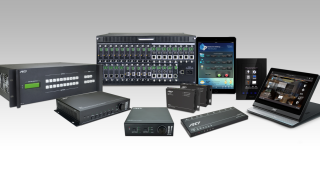 RTI is now shipping an extensive line of AV signal management solutions. Offering tight integration with the RTI control ecosystem, the video matrix switches, extenders, presentation scalers, and audio mixer amplifiers deliver a complete end-to-end solution for residential and commercial projects. The comprehensive video distribution offering utilizes HDMI and HDBaseT technology to deliver high-quality 4K video throughout an installation. The VHD-4 and VHD-8 HDBaseT video matrix switchers extend video, IR, and RS-232 signals up to 230 feet over a single Cat-5e/6 cable. Also new to the lineup are the VHX-4 and VHX-8 HDMI matrix switchers, featuring cross-point switching and HDMI 2.0 to deliver 4K video at 60Hz. In addition, a range of extenders, splitters, and wall plates is available to meet the unique needs of every installation. To meet the AV requirements of today's corporate, education, and retail environments, RTI now offers high-performance, modular matrix switchers and presentation scaler switchers. Designed for versatility, the VFX-124 and VFX-248 flexible-matrix switchers feature fixed outputs and open slots (12 and 24 respectively), each configurable as inputs or outputs depending on the application. To handle different signal types, a wide variety of input and output cards is available for HDMI, HDBaseT, VGA, audio, and more. The VSS-51 Presentation Scaler Switcher Kit combines seamless switching with advanced scaling and is well suited for conference rooms, classrooms, and lecture halls. The unit accepts a variety of video input formats and includes a microphone input as well as the VSW-51R HDBaseT receiver for delivery of video to an additional display. "RTI control systems offer the customization, processing power, and integration options that are essential in commercial projects," said Mike Everett, vice president of global sales at RTI. "The addition of our line signal management products expands the RTI ecosystem and gives our dealers a complete solution for tightly integrated control and AV distribution."